The subject matter of 'The Ode to the Red Cliff', the famous poem by the Song dynasty painter Su Shi, was reserved for some of the finest rhinoceros horn libation cups of the late Ming / early Qing dynasty. 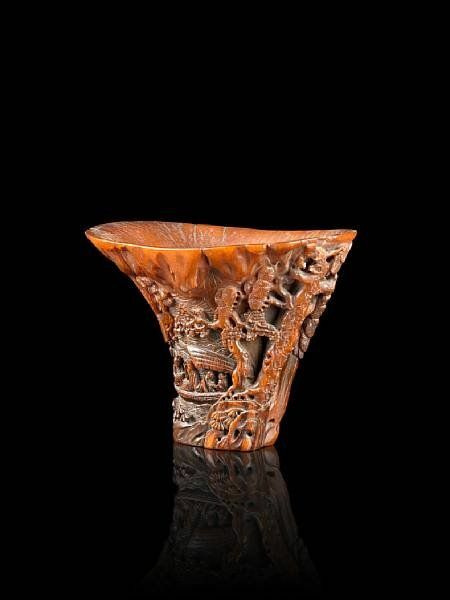 For an example of similar high quality in the Metropolitan Museum of Art, New York, donated by J. Pierpont Morgan, see Jan Chapman, The Art of Rhinoceros Horn Carving in China, London, 1999, pg. 210, pl. 289. Vessels carved from rhinoceros horn are much rarer than more commonly found libation cups which follow the natural form of the horn, and are likely to have been expensive commissions. 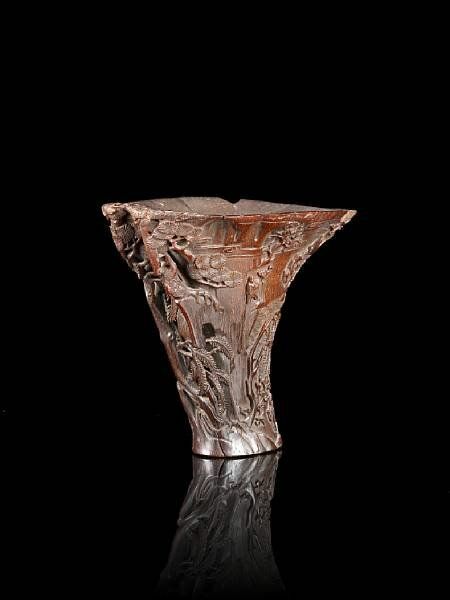 For an almost identical rhinoceros horn stemcup, incised with a Tianqi reign mark, see an example sold at Sotheby's New York, 23 September 1995, lot 298, and again, 19 March 2007, lot 385. 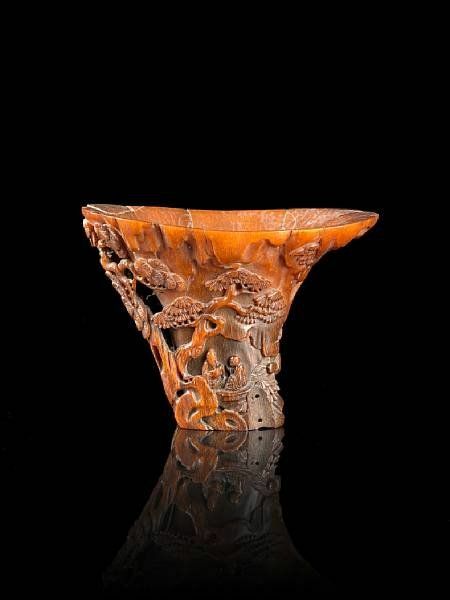 See also a rhinoceros horn stemcup in the collection of Harvard University Art Museum, illustrated by Thomas Fok, Connoisseurship of Rhinoceros Horn Carvings in China, Hong Kong, 1999, pg. 109, pl. 61. The source of the quotation is Qur'an Sura 76. The first element of the inscription ('In the name of God . 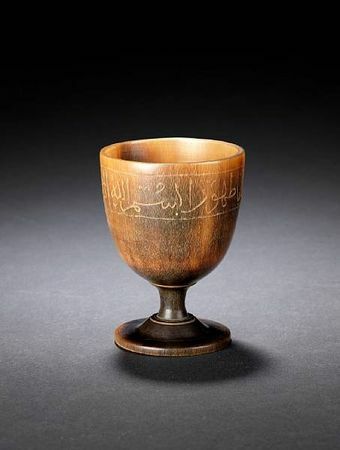 . . ') is the invocation that appears at the head of each sura of the Qur'an. A very rare rhinoceros horn cup with animals in relief, china, ming dynasty, possibly 16th ct. or earlier. 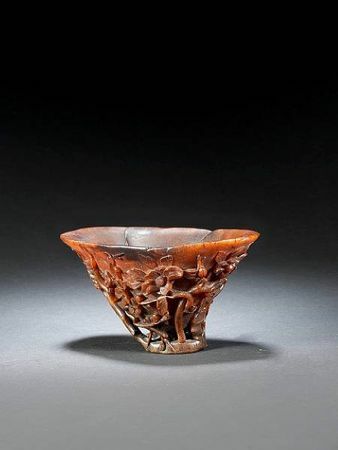 An important and extremely rare rhinoceros horn deer-form libation cup. 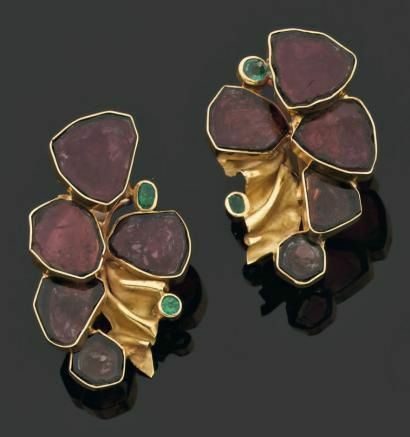 ming dynasty, 16th/17th century. 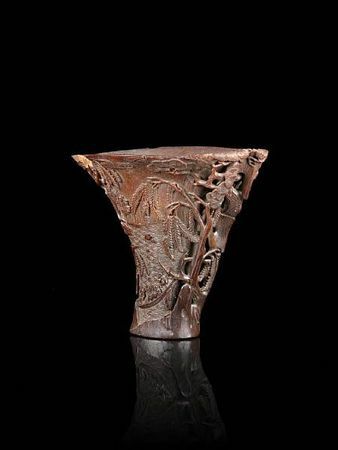 An extremely rare archaistic tripod rhinoceros horn libation cup.. qing dynasty, 17th/18th century.